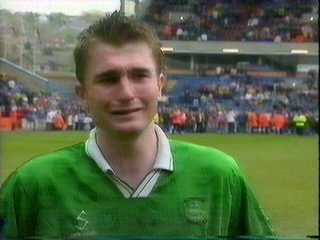 No Argyle supporter at Turf Moor on May 2nd 1998 will ever forget it. The last match of the season and a point would have kept us up. More than 2,000 Greens created such an incredible atmosphere, the like of which I do not remember. We gave everything that day (as did the team), and the feeling at the final whistle was all the more painful for it. 2,000 Plymothians giving their all and doing it as one. A very special day. Action: a wistful view of the goals. Afterthoughts: Mick Jones' wise, wise words. What a good bloke.